For JD(S) leader and former Prime Minister Deve Gowda and his kin, this Parliamentary election is one the family just cannot afford to lose. The outcome will not only have a bearing on the relevance of Gowda family in the state, it will also impact the future of the fragile ruling JD(S)-Congress combine. This is because the family has put everything at stake, including its political standing and prestige, by fielding grandsons, Nikhil and Prajwal, this time from the all-important Lok Sabha seats of Mandya and Hasan, respectively. 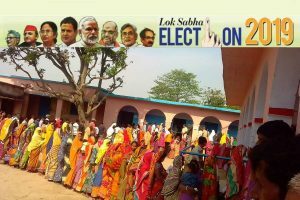 The former Prime Minister himself is contesting from Tumakuru, a seat he was forced to choose, having left Hasan for Prajwal. The family chose to give the tickets to the grandsons under the JDS banner, ignoring long time aspirants and leaders who have served the party well and with dedication over the years, enough reason for many seniors and cadres to rebel now. In fact, initially, Nikhil was an unlikely candidate for Mandya, having just had H D Kumarswamy, his father and state chief minister, launch him into films. The time, however, appeared opportune considering that Congress, the alliance partner, was only too willing to concede the three seats of Mandya, Hasan and Tumakuru, to the alliance partner, the JDS. Travelling through the constituencies, one is struck by the sharp divide within the Congress workers and a section of their leaders and even the JDS, for that matter, in these constituencies. In Mandya, for example, the rookie Nikhil, 29, is up against Sumalatha, 55, the Independent candidate and widow of MH Ambareesh , the late film actor and former MP from the constituency. She is getting overwhelming support from the rebel Congress workers while the BJP is backing her by not putting up a candidate. Ambareesh was extremely popular as an actor in the entire belt across Mysuru and Hasan as well, leading to the inevitable birth of scores of fan clubs in the process, a practice unique to south India. In addition, Sumalatha herself has acted in a large number of south Indian films. Besides,her son, Abhishek, too is an actor. Even though a first timer herself, she is finding that cutting her teeth into politics is not all that daunting, albeit for now. Riding on the committed fan base of her late husband, discord within the local Congress leaders and workers who are not willing to back the common JDS candidate and the open support of popular Kannada actors like Darshan and Yash, she could not have asked for more by way of encouragement. Especially, considering that her film actor husband was a three time MP from the constituency. Added to all this is the backing she is getting from the local farmers association who feel that Ambareesh had done a lot for the constituency, without playing the cast card even though he belonged to the dominant Vokkaligga community himself. As Erappa, a farmer, told The Statesman in Mandya: “The Gowda family has not done enough for the constituency compared to the contribution made by Ambareesh. Besides, nothing prevented the JDS from giving the ticket to local leaders instead of promoting only the Gowda family. “It would have been better for the Deve Gowdas to field Nikhil first as an MLA, is the common refrain. Large sections of JDS workers also echoed similar sentiments. What is making the ride more difficult for Nikhil are the sexist remarks that his uncle Revanna made against Sumalatha recently. Kumaraswamy too has not been a saint in this matter,something that has not been liked by the farmers and others. Seemingly unperturbed, Sumalatha, is proceeding with confidence ,something which she displayed during her interaction with this paper. For someone who is entering politics for the first time, her response to the “no holds barred “ JDS campaign against her, seems to be making her more determined to fight it out. A section of the local Congressmen , on their part, are miffed with the leadership for not putting up a candidate from the constituency, especially as Sumalatha herself was keen to fight under the ‘Hand ‘symbol, considering that her husband belonged to the party. As Rajsekhar, a local panchayat head, maintained “ it is difficult for us to stomach the fact that our party conceded the seat to JDS with whom we have been daggers drawn all these years. “If the party decides to take action against us ,so be it. But we definitely cannot support the JDS candidate and instead are happy to back Sumalatha.” This open defiance within the Congress party is evident in Hassan and Tumakuru as well. And the reasons are the same. 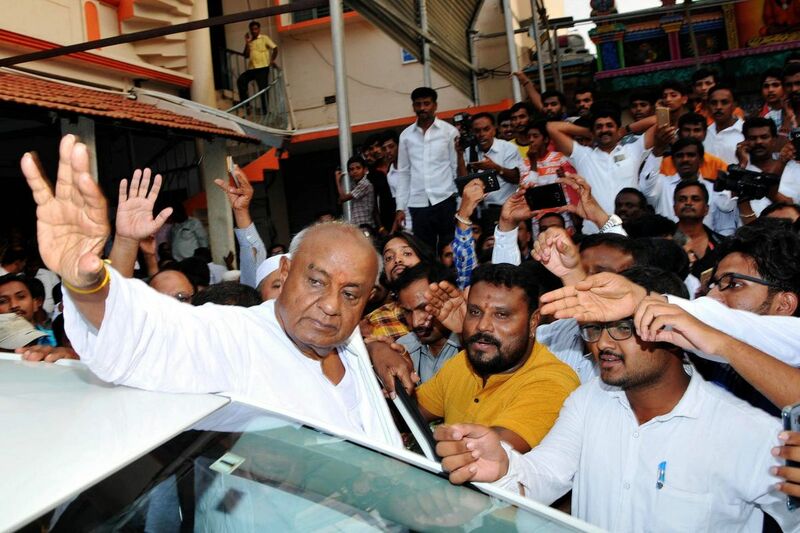 In private , he was, however, quick to admit that in all the three constituencies, the going would be tough for the JDS as the party is on a sticky wicket. Incidentally, in Tumakuru from where Deve Gowda is contesting, the party has managed to appease leading Congressmen,Rajanna and the outraged sitting MP Muddahanumegowda, who had to concede the seat to Deve Gowda. On the ground though the party’s workers remain hostile to JDS. The reasons remain identical to the one that the JDS faces in Mandya and Hassan. Above all, there is the strong fight that BJP’s Basvaraju is giving to the JDS supremo, aided by the discord in the Congress workers. While on the subject, Nikhil maintained that he was aware of the conflict within the Congress and the support that Sumalatha was drawing. But he expressed confidence that with the JDS juggernaut behind him, coupled with the huge support that he draws from grandfather,father and uncle, he would definitely do well. Responding to queries he said that he may be a rookie in politics but he had an encyclopaedia in grandfather, Deve Gowda, at home to learn from. He did add though that he would promote job opportunities in the constituency so that the youth do not need to travel to Bengaluru. His brother,Prajwal, however, appeared more confident, going by his response to the media and the way in he was addressing public rallies. His advantage is that he has been a youth leader in the party and even nursed his father,Revanna’s assembly constituency, Holenarsipura. He even called himself an uncut diamond which the constituency would help polish, while talking to a newsperson. Senior rebel Congress leaders,on their part, point out that Prajwal and Nikhil do not have the required experience considering that they are debuting in politics. To that extent the risk factor for the JDS is high, notwithstanding the fact that the Gowda family is pumping in huge sums in these elections,to go by the common allegation here. These observations apart, the undeniable fact is that the Gowda youngsters have indeed struck a rapport with the young first time voters. In Hasan incidentally, Prajwal is also up against a seasoned Congressman , A Manju, who left the party to join the BJP and is now fighting the JDS in the elections .According to him,the JDS is promoting dynastic politics. This scenario, which is being played across Mandya, Hasan and Tumkuru, has left the Gowda family worried though partymen are quick to claim that voters’ sentiments can be made to change even 24 hours before the D –day. The reference is obviously to the allegations doing the rounds that the JDS has earmarked huge sums to ensure the Deve Gowda and his kin make it in this election,something the party rubbishes quickly.